Plants grow in the most amazing places ! Phytotechnology is the strategic use of plants to solve environmental problems by remediating the qualities and quantities of our soil, water, and air resources and by restoring ecosystem services in managed landscapes. Traditional phytoremediation has been largely focused on the soil and groundwater clean-up of hazardous waste sites in removed locations. Phytotechnology expands this umbrella to include many of the natural resource management challenges we face in cities, on farms, and other landscapes more integrated with daily public activities. 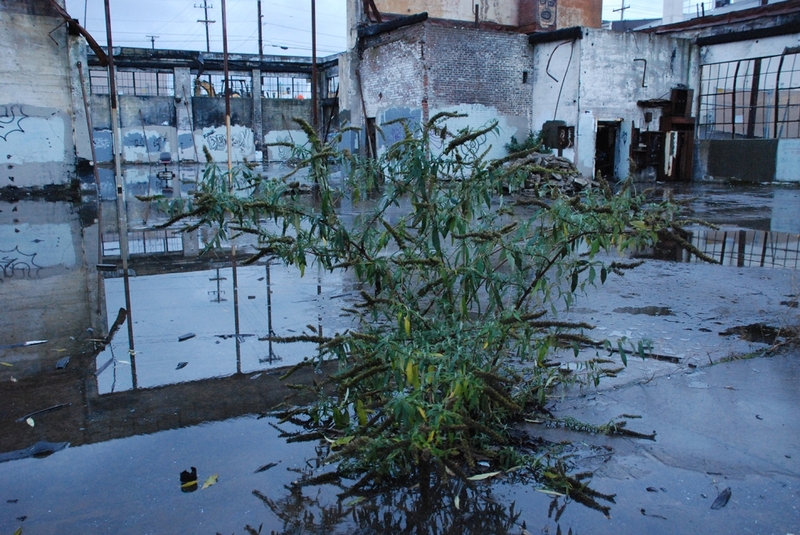 Wetlands that treat wastewater, rain gardens that treat stormwater, poplar tree plantings that treat soil contamination, urban tree canopies that treat air pollution, specialized plants that treat decommissioned mine sites are just a few examples of phytotechnologies. 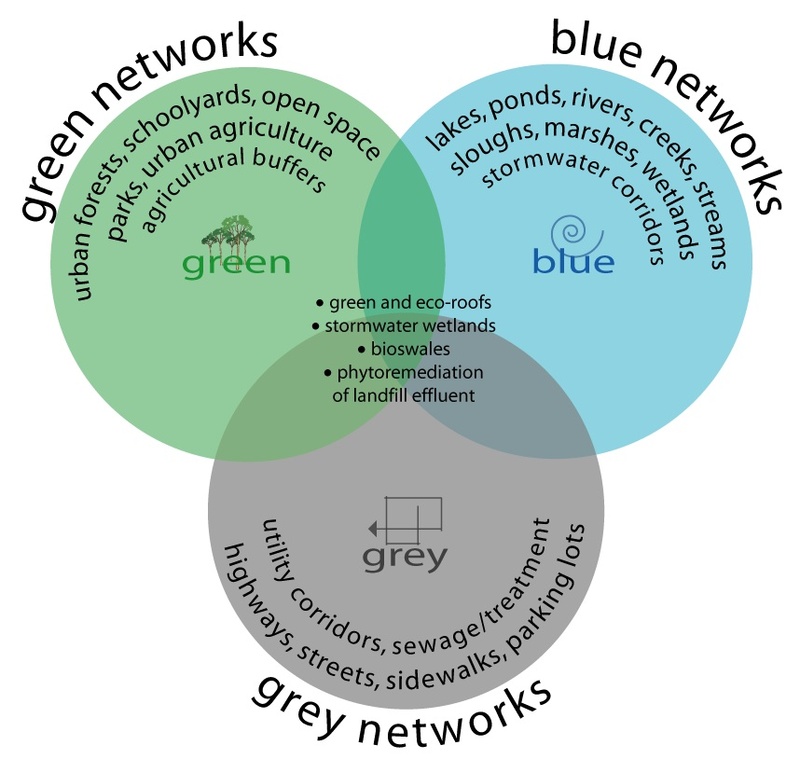 The diagram to the right offers a visual understanding of the intersection where phytotechnology is particularly active- the intersection between our water networks, our plant/soil/nature networks, and our engineered networks of pipes/buildings/urban infrastructure. Phytotechnology uses science and engineering to design systems where plants can thrive and also come into contact with polluted resources- resources that humans depend on for survival and health. When plants come into contact with polluted resources, they use a number of different physical and physiological mechanisms to sequester, uptake, transform, or limit migration of contaminants so that the safety of our soils, waters, and air can be improved for human use. Plants are particularly good at this since they have been practicing and providing these services naturally since the beginning of time. Designing plant-based treatment systems usually is much more cost-effective, and in addition to treatment of natural resources, plants offer many other ancillary benefits such as habitat, livability, emotional connection/stress reduction, and property value increase. Phytotechnology is a very diverse and multidisciplinary field, including biochemists, analytical chemists, plant physiologists, botanists, ecologists, engineers, designers, landscape architects, health scientists, toxicologists, and horticulturists. In close partnership with these scientists are the regulators who support phytotechnology permitting and the industries that actually build the systems and apply them in the landscapes. Increasingly, phytotechnology is also including a new sector of professionals who are specialized in the on-going maintenance of these systems. Plants are the foundation of phytotechnology. Microbes are very important as well, but we usually have less choice with them, other than managing the suitable habitat. Periodically, we will offer a story about a plant that is useful in phytotechnology applications. As we approach autumn in the United States, Red Twig Dogwood really shines with its bright red presence in the landscape. It is a woody shrub growing up to 8 feet tall (with some dwarf cultivars in the horticultural trade), flowering white in the spring and favored as animal browse and habitat. Though it is often less used in phytotechnology research, compared to other woody shrubs such as Salix sp., it nevertheless shares some of the same characteristics that make these shrubs useful here. 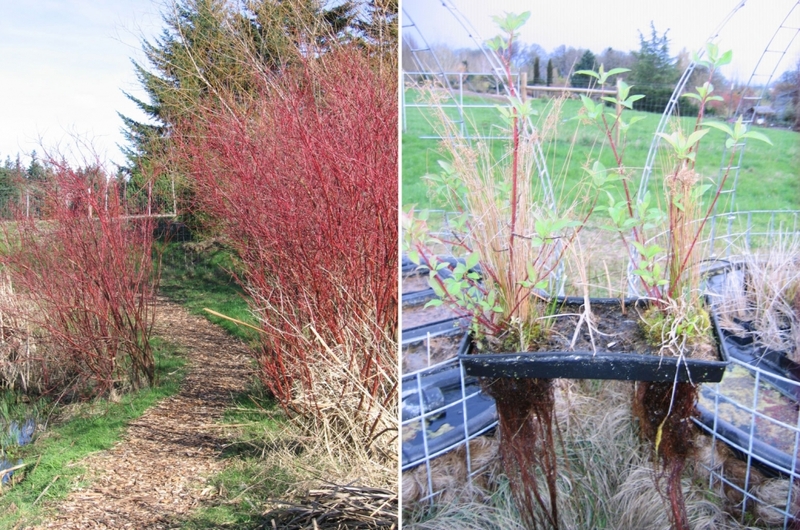 You can propagate Cornus from unrooted stem/pole cuttings in wet environments, and it is tolerant of a wide range of wet to dry soil conditions. And as you can see in the photos, Red Twig Dogwood’s root system can be quite extensive, especially in floating wetland systems. This shrub is particularly useful in applications focusing on water treatment or ecosystem service restoration. The highly ornamental qualities are just a great bonus! Post-harvest secondary uses for this plant include fiber for weaving and biofuel feedstock.